Andreas Amrhein is a cosmopolitan storyteller par excellence. Born in Marburg in 1963, he grew up in Liberia/Western Africa, studied fine arts in Berlin, London, Malmö and Chicago, and became a Master under the painter and graphic artist Walter Stöhrer at the University of the Arts (then HdK) in Berlin. Employing his multi-layered, figurative pictorial vocabulary, Andreas Amrhein juxtaposes, with unconventional waywardness, elements appropriated from commercial culture and the everyday that contradict and likewise compliment each other. His works are largely inspired by literature, film and comics, and by his examination of clichés associated with or produced by various cultures. Having dedicated his attention, in the 1990s, principally to works on paper in which multilevelled cosmoses were created by layering text elements and other signs taken from the world of advertising, he began painting on canvas at the beginning of 2000. 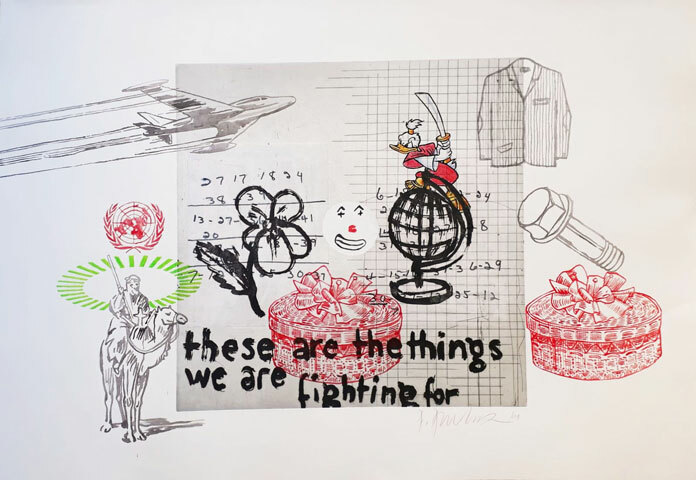 The most recent developments have produced a balanced coexistence of works on both paper and canvas that correlate to one another in terms of content through the artist’s montaging of common clichés upon alienating backgrounds. Within the pictorial motifs thus emerging, the, by all means, historical artefact of the porcelain figurine has become a leading character over the past years; staged amongst various topoi taken from a globalised consumer culture and the world of entertainment, they are presented by the artist in great variety, framed within an altogether new and provocative, critically ironic dialogue. Gestural brushstrokes alternate with delicate contours—watery planes and sketchy drawing with carefully detailed painting. Text elements have remained an important component of his compositions. Andreas Amrhein plays with language and contrives allusive titles that demand the adoption of new perspectives. Composition and intuition determine the forms and colours of his anachronistic pictorial worlds.